The end of 2013 is fast approaching and 2014 is just around the corner. At Modern Doors we are now looking at the last 12 months, realising how very productive this year has been for us. Most importantly we have upgraded our online shopping platform to Magento, which provides an improved, faster and more secure shopping experience for our clients. As well as this, we have partnered with the Trusted Shops scheme, adding a free external money back guarantee service for all online orders. We have also implemented an automatic shop review system for our customer to rate our overall service and help new clients make an informed decision. This new platform allows us for further expansion and the implementation of additional features in the future. An individual product review module is in the pipeline for early spring 2014. We have also significantly improved our door showroom in London, extending our range of doors on display to show the latest models of both internal doors and front doors available in the UK. A number of bespoke internal and external doors have also been added to our display, taking the total number of doors on display to over 50 unique styles available to view in our showroom. Answering a growing demand for a faster door delivery service, we have restructured our logistic department to be able to deliver readymade timber doors anywhere in mainland UK within 4-6 working days from orders placed. Our bespoke door service is running on full steam and we don’t shy away from undertaking even the most complex projects, both residential and commercial. 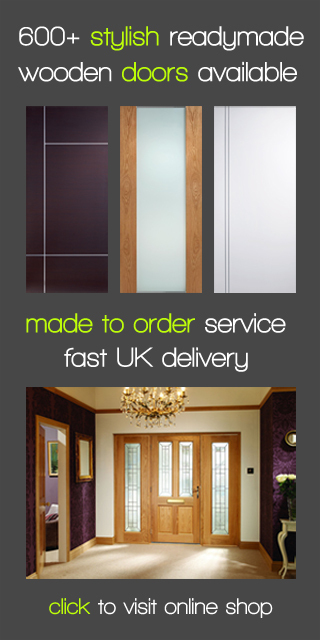 Most importantly even in the busiest periods, our delivery times for bespoke doors never exceed 4 weeks. We are extremely pleased with the reliability and overall quality of our service and our clients have been too. We are now looking into 2014 with many new contemporary door models in the pipeline and plans to add more quality features to our shopping platform. We are hoping for an even more productive 2014 with many more fully satisfied customers.